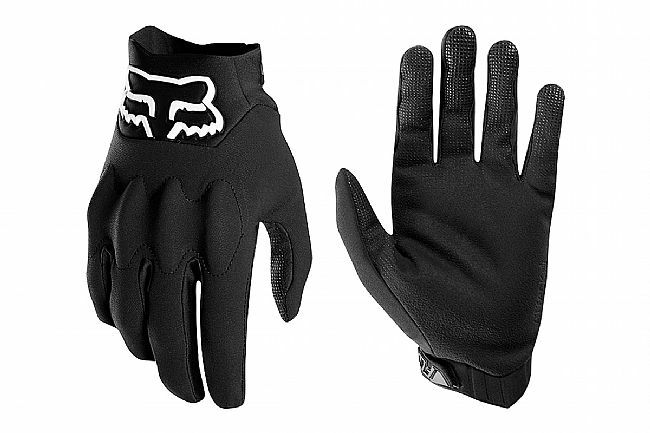 The Fox Attack Pro Fire Gloves give you warmth without the weight or bulk. It is warm, waterproof and wind-resistant while retaining an ultra-minimalistic feel. The glove uses a 3-layer softshell fabric to shield you from the elements while staying breathable. The thin fleece lining and waterproof palm keep your digits both warm and dry. And the cuff has an extended length to lock out water and drafts, and to improve compatibility with jackets and sleeves. DWR treated premium low-profile winter glove. 3-layer softshell fabric shields against the toughest conditions. Longer neoprene cuff for a secure fit that helps prevent the elements from getting in. Conductive thread at index and thumb for touchscreen compatibility. Silicone gripper on finger tips for lever control.